This is the last–for a little while, anyway–in my string of recipes using Basic Marinara Sauce. (Another delicious and easy dinner using a portion of this sauce is Sausage, Pepper and 2-Cheese Pizza.) 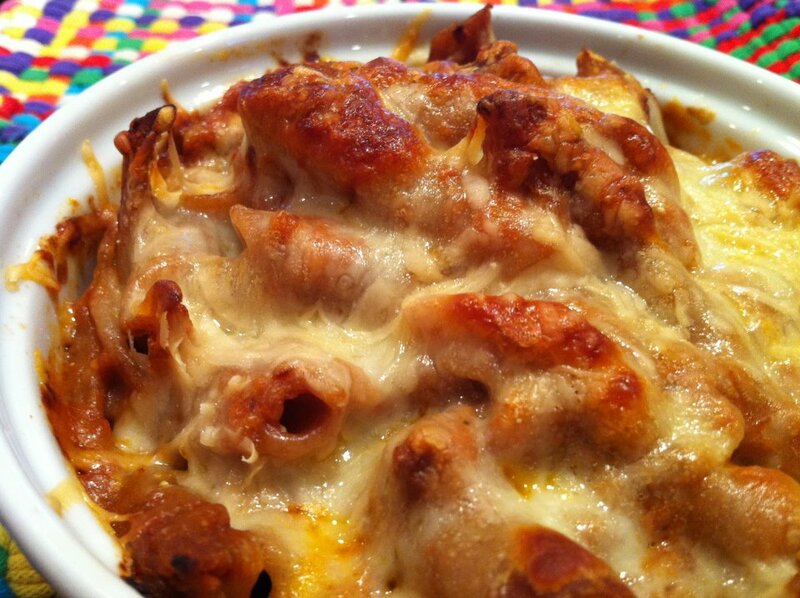 The following baked pasta dish is unique in that the meat does not have to be sauteed prior to mixing with the pasta. The first time I tried this, I was apprehensive. However, the meat–be it ground turkey, beef or sausage–cooks in the oven, imparting great flavor, while saving time and another dirty pan. Being a fan of Ezekiel breads, I experimented this time with Ezekiel’s sprouted grain pasta. Packing sprouted wheat, lentils, millet, and three other sprouted grains, this pasta is loaded with nutrients. The texture, however, is not as “al dente” as regular pasta. My family liked it, although I would recommend trying a regular whole wheat pasta the first time…unless your are feeling adventurous. For a gluten-free pasta option, we really like pastas made with a corn and quinoa blend. The genius factor with this recipe is that the ground turkey need not be cooked before mixing it with the remaining ingredients...and the end result is divine! Transfer to a greased 8×8 baking dish and sprinkle with remaining cheese. Bake at 350 degrees for 30 minutes or until cheese is lightly browned. Let stand five minutes before serving. Yum! Made tonight with 93% lean ground beef. Added extra garlic and crushed red pepper. Will have to make this one a staple! Thanks! I am so glad this will become a regular at your house and appreciate the great feedback. Thank you!